When I go to my local bookstore, I’m always on the lookout for a surprise–something new, that I haven’t heard of, that I know the kids in my book club (mostly 3- to 5-year-olds) will love. 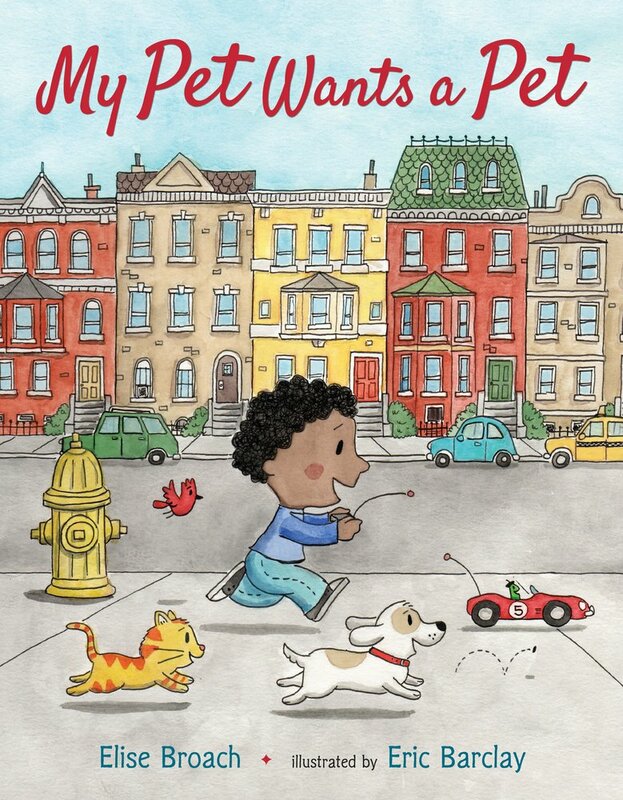 MY PET WANTS A PET, written by Elise Broach and illustrated by Eric Barclay is one of those books. 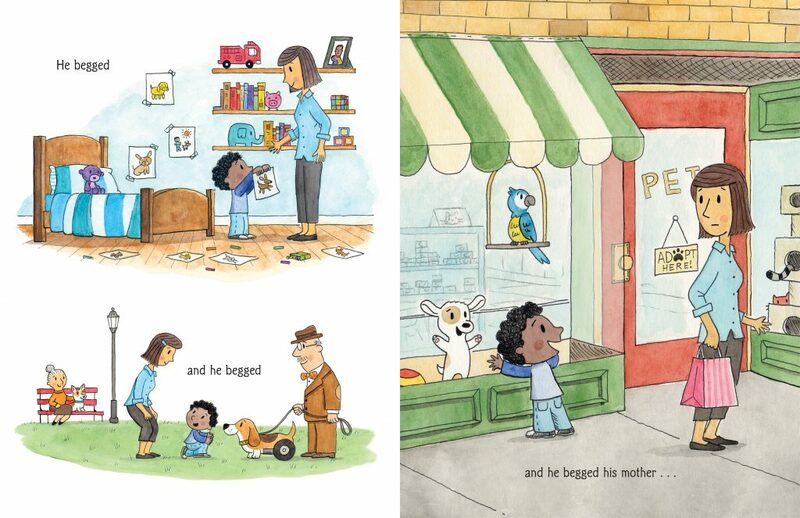 Interior artwork from My Pet Wants a Pet written by Elise Broach with illustrations by Eric Barclay, A Christy Ottaviano Book/Henry Holt BYR ©2018. Broach’s story starts off in familiar territory. The main character wants a pet. He begs, and begs, and begs until, finally, his mother says YES! 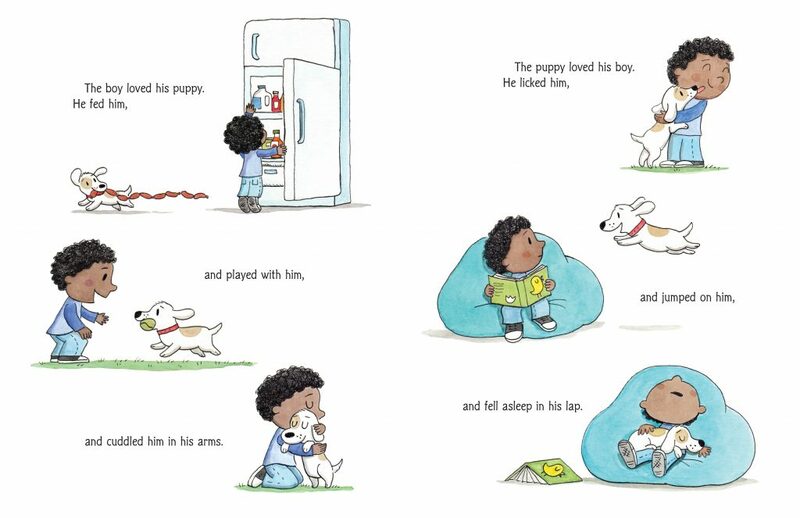 Barclay’s uncluttered, colorful illustrations show the boy and his new puppy playing, cuddling, riding a bike, and before long we leave familiar territory behind as the puppy realizes he wants a pet, too. Mom thinks this is a “terrible idea” but, puppy and boy prevail. And so it goes, throughout the whole story with one pet after another realizing that they, too, want something to care for. In each case, the pet chooses a pet that would, under normal circumstances, be considered a rival or–worse yet–food. But this is not a Jon Klassen book and no one gets eaten. The animals and insects are good to each other and when they do chase it’s “all in good fun.” Everyone is content, except one character–Mom. She progresses from concerned to harried to annoyed as more and more pets invade her house. (Look closely at the illustrations to see why!) The boy formulates a plan to console her, but I won’t tell you what it is. You’ll have to read the book! Simple illustrations and an engaging story make MY PET WANTS A PET perfect for story time with a large group of kids. Even from several feet away, listeners will catch details in the illustrations that add humor and warmth to the story. And Broach’s text allows readers to anticipate what’s coming, but still manages to keep us on our toes. After all, we may think we know what’s going to happen, but when a bird takes a worm for a pet there’s no telling how things will end. 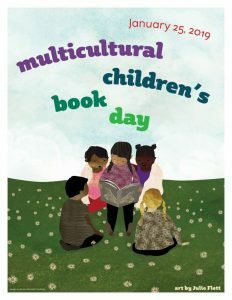 Click here for the publisher’s page to find a downloadable activity guide. See another recent review by Colleen Paeff here. 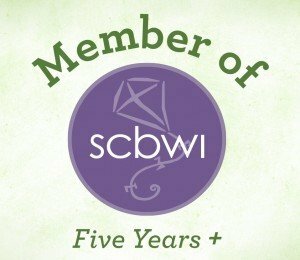 Reviewed by Colleen Paeff – Colleen lives in Los Angeles, California, where she writes fiction and nonfiction picture books. 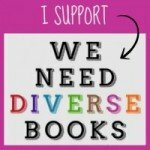 She hosts the monthly Picture Book Publisher Book Club and its companion blog, Picture Book Publishers 101. Look for her on Twitter @ColleenPaeff. This week is National Pet-Sitters Week. Then, on March 23, it’s National Puppy Day, so let’s give a shout out to pets and puppy lovers and their caregivers everywhere! 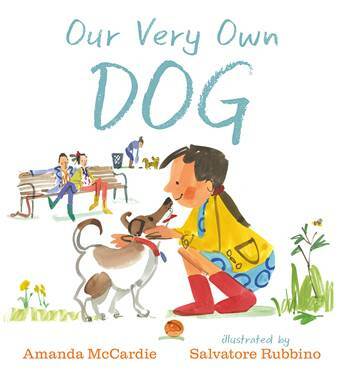 Our Very Own Dog by Amanda McCardie is THE book to share with your children if you’re even just entertaining the idea of getting a pet. It’s also the perfect picture book to read once you’ve decided to welcome a new dog into your home. The story revolves around Sophie, once a shelter dog, and now starting over with her forever family. 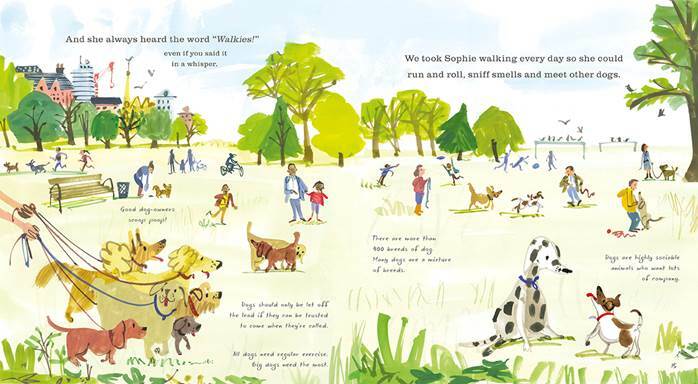 Written and illustrated in a gentle, accessible way, Our Very Own Dog will help children learn all about what’s involved in caring for and training man’s best friend. Whether that involves feeding them, taking them to the dog park to socialize or bathing them, McCardie has covered it all. 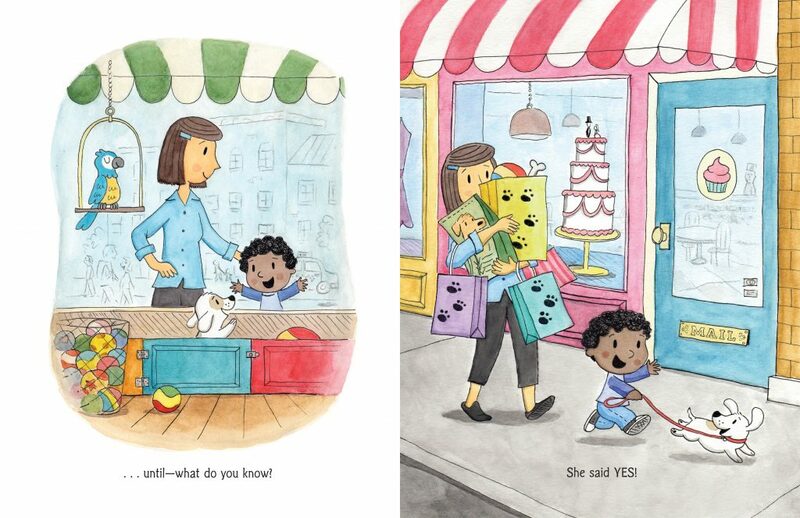 Interior spread from Our Very Own Dog: Taking Care of Your Very First Pet by Amanda McCardie with illustrations by Salvatore Rubbino, Candlewick Press ©2017. Amanda McCardie is the author of several books for young readers, most recently A Book of Feelings. She says, “Sophie is dear to my heart. She was the cheery, cheeky little dog I grew up with in real life.” Amanda McCardie lives in London. Salvatore Rubbino is the award-winning illustrator of Just Ducks!, A Walk in London, A Walk in New York, and A Walk in Paris. He says, “I have always been fond of cats. But by studying dogs and watching their fascinating behavior, I now find that I love dogs, too!” Salvatore Rubbino lives in London.